The Residence Inn Melbourne hotel offers modern amenities, thoughtful guest services, and spacious accommodations to ensure all guests feel the comforts of home while still experiencing the quality of a Marriott hotel. Our hotel in Melbourne, FL is just 2.5 miles from Artful Awakenings, 1.5 miles from the Melbourne Airport and is convenient to I-95, Historic Downtown, Kennedy Space Center and Melbourne Beaches on Florida’s Space Coast. Standing out among hotels in Melbourne, FL, the Residence Inn Melbourne hotel features spacious and well-appointed suites to fit any business, government or leisure travel need. Guests can start their day with a free breakfast and unwind in the evening at our Social Hour, Monday through Wednesday. 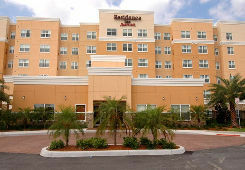 The Residence Inn Melbourne is a top choice among Melbourne, FL hotels. Ideal for short and extended stays, our all-suite Melbourne, FL hotel offers high-speed Internet access and complimentary hot breakfast. One of the premier extended-stay hotels in Melbourne, FL, our all-suite accommodations boast full kitchens and separate areas for living & sleeping. The friendly staff at our hotel in the Melbourne, FL location is available 24 hours and works hard to ensure there guests feel right at home. The Artful Awakenings Cosmetic Surgery Center is located on the beautiful Florida Coast in Melbourne, Florida. We are surrounded with highly desirable resort hotels, bed & breakfasts, restaurants and many other attractive getaway features to accommodate almost any desire and budget. Our fantastic Getaway Packages include your room, meals, chauffeured transportation and the surgical procedure. They are priced at or below what many patients would pay for just the procedure alone in their area. Artful Awakenings GetAway Packages are ideal for those wishing to have plastic surgery away from local friends, family and neighbors. We can put together packages for one, two, entire families or more. If you refer a friend to us for surgery, ask them to consider having their procedure done at the same time. Not only will you earn a free procedure worth thousands of dollars from our Referral Program, you’ll have a companion to be with you during your Artful GetAway.